Former Manchester United, Brighton & Hove Albion, Everton and Chelsea midfielder Mickey Thomas has been diagnosed with stomach cancer. Thomas was diagnosed last month and starts chemotherapy and radiotherapy treatment next week, before an operation to remove the tumour and then another course of chemotherapy. The 64-year-old began his career at Wrexham, before spending three years at Manchester United, where he scored 11 goals in 90 matches. He then spent a brief spell with Everton, before joining Brighton and playing 20 times for the Seagulls. He then went on to play for Stoke, Chelsea, West Brom, Derby, Shrewsbury, Leeds, Stoke and Wrexham. He also played 51 times for Wales. Thomas has worked in the media since retiring and often covers Manchester United and Wrexham games. Speaking to WalesOnline, Thomas said: "I've got a serious problem. I know that and I've got a big fight ahead of me obviously. "It's one that I've not foreseen coming, but obviously it's happening and I've just got to get on with it. It's quite scary so I've just got to wait and see. I've obviously got a lot of treatments to come and lots of chemotherapy and an operation to come as well. "I can only wait to see how I respond to that sort of treatment." A GoFundMe page has been set up to help Thomas cover his living and travel expenses, plus some of the medical expenses related to the treatments he requires – including having all of his teeth replaced. It had raised more than £6,500 of a £20,000 target by earlier this morning. 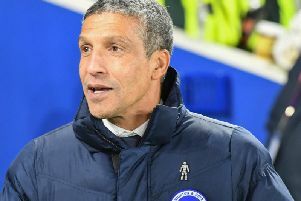 Former Brighton striker Michael Robinson was diagnosed with incurable skin cancer last year.